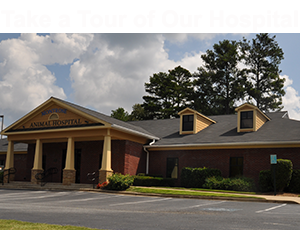 At Montrose Animal Hospital, we are particular about your pets health and wellness. 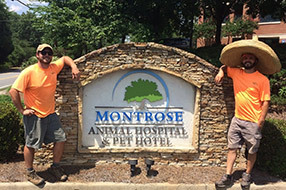 We take great pride in our ability to create a positive impact in the lives of our neighbors and their pets. 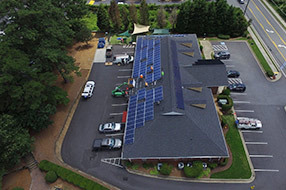 Our mission this year was to make a difference in our community and environment as well, by "GOING GREEN" with a solar energy renovation. 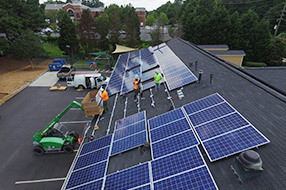 In the last few months Creative Solar of Kennesaw wrapped up the installation of 192 photovoltaic solar panels on our roof, which should produce 45% of our energy needs. 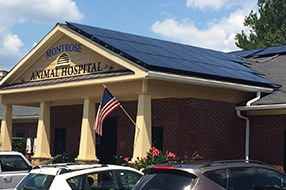 In addition to our solar panels, we've also retrofitted our practice with LED lighting in place of fluorescents. This conversion alone will reduce our electricity consumption by over 16%! Our hope is that with eco-friendly advancements we can reduce the size of our environmental paw print for years to come.